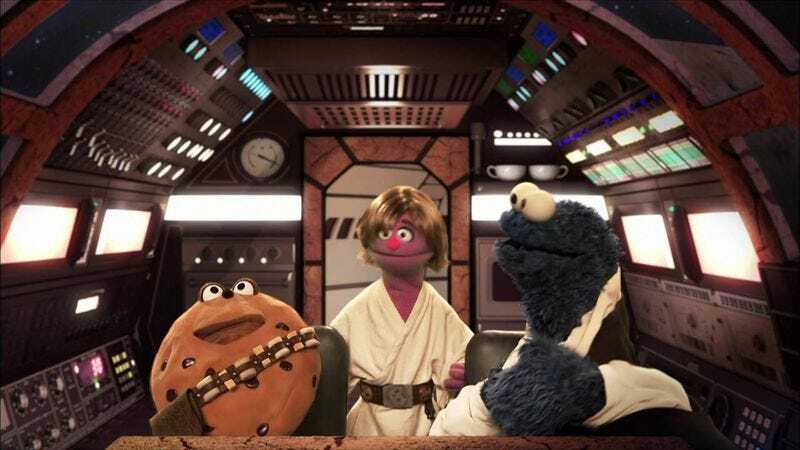 Screenshot: Sesame Street's film parody "Star Smores"
Through the past 47 years on television, Sesame Street has been one of our most enduring cultural touchstones, as generations of children have learned letters, numbers, sharing, and cooperation at the feet of Big Bird, Cookie Monster, and Elmo. So a leap to the big screen is such a natural idea, it’s surprising it’s only happened twice, with 1985’s Follow That Bird, and 1999’s The Adventures Of Elmo In Grouchland. But keeping to Sesame Workshop’s roughly-every-15-years schedule, a return to the big screen is in the works. Deadline reports that Warner Bros., whose sister company HBO now airs Sesame Street before passing episodes to PBS for a second run, has hired David Guion and Michael Handelman, the screenwriting duo behind Night At The Museum: Secret Of The Tomb, Dinner For Schmucks, and the Zach Braff vehicle The Ex. It’s too soon to tell what the film will be about, or when it will reach the multiplex, but Sesame Street has had great success with movie and TV parodies like “The Hungry Games: Catching Fur” and “Game of Chairs,” so we could end up with Bert And Ernie Need Wedding Dates, Mad Murray: Furry Road, or Fifty Shades Of Grover. Or maybe we’ll just get some backstory on what happened to Gordon, Bob, and Luis.